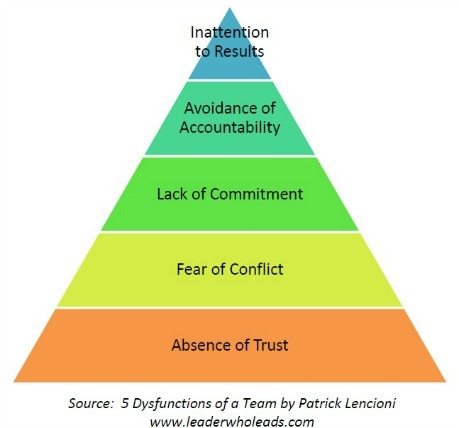 Patrick Leoncini book "The Five Dysfunctions of a Team" highlights attributes that prevent a work group from becoming a high-performing team. Leaders who lead must prepare themselves to address and dismantle these in their quest to transform a group of individuals into a team. Trust is foundational to the functioning of any team. Without it a group of individuals will not be able to work well together as a team. The lack or absence of trust occurs when insecurity and competition are at unhealthy levels within a group. Members question the motives and hidden agendas of fellow employees. When members of a group fear conflict, healthy debate does not occur and team members may not put forth differing ideas/opinions. Members are not honest or transparent, especially when speaking honestly may result in conflict. Those who fear conflict often have very strong opinions, but in their minds it is easier (and safer) to remain silent, keeping their thoughts to themselves. It may be easier in the short-term, but hidden/unresolved conflict has a high likelihood of resurfacing again. Lack of commitment can occur for several reasons. One reason is that a member may not understand the goal of the team and their role in reaching that goal. Another reason could be that they do not agree with the goal of the team. Or, they are not sure of their part in the team: either their acceptance by team members or their ability to meet or exceed what is expected of them. Avoidance of accountability is the reluctance to set measurable goals, track results and reward accordingly. Not holding oneself and fellow team members responsible for fulfiling their part (pulling their weight) is usually due to fear: fear of failing. Inattention to results is inevitable when the other barriers to teamwork are firmly in place. Lack of trust, mixed with fear, lack of commitment and avoidance can only produce inattention to results. Actually, all these combined can only lead to poor results. Meeting and exceeding expectations are intentional, not accidential. How does your team rate? Using this assessment, rate the dysfunctions for your team: High, Low or at any point in between.